How much does it cost to buy a private jet? There are two ways in which you can own a private jet: full ownership in which you own the full plane, or fractional ownership in which you own a portion of a plane. To choose the most convenient solution for you, the first question you need to answer is: what you need the aircraft for? This article contains average prices, which aim is to give you an idea of what is required to buy a private jet. Each deal has its own story and the price may change depending on the flight hours, year of manufacture, general status of the aircraft, maintenance status, engine health status, personalization of the interiors and others. The cost of buying and owning a plane differs by the model. In very simple terms, the bigger the plane, the more it will cost to both buy and maintain. Costs depend on the usage of the plane and owners should take into consideration also other expenses such as aircraft management, crew salaries, hangar costs, insurance, training, maintenance, fuel, basically the fixed and the operating costs. 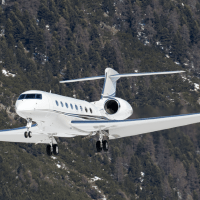 A brand-new Gulfstream G450 might cost 40m USD; pre-owned models are available for 14m USD, depending on age and condition. Expected variable costs are 1.6m USD/year, and annual fixed costs are about 880,000 USD. Less expensive in terms of initial investment might be the Bombardier Challenger 605. A new model will cost 27m USD, with used ones sold for 15m USD. Expected annual variable costs are 1.5m USD and fixed costs are about 725,000 USD/year. An Embraer Phenom 300 will cost you 9.2m USD, and previously owned models are priced between 7m and 8m USD. Annual variable costs are predicted to be 800,000 USD, with an additional 343,000 USD in fixed costs. Another common jet, ideal for those who fly short flights frequently, is the Phenom 100E. A new one will cost around 4.4m USD, and 2m USD for a previously flown model. 470,000 USD is the annual average fixed cost to maintain this aircraft and 150,000 USD the variable expenses. Sometimes, full ownership might not be your cup of tea, perhaps because of cost, perhaps because of your intended usage. In these cases, fractional ownership may be a good choice. As the name suggests, you purchase a fraction or share of an aircraft, and then pay a portion of the associated costs (calculated on your percentage), including an hourly flight rate for usage, and monthly or periodic charges to cover all the fixed costs of running the aircraft. Since you own a share of a plane, you still have a depreciable asset and you have access to an aircraft with as little as 6 hours' notice. If we look at the costs for a full ownership of an Embraer Phenom 300, as shown above, and compare them with the costs of fractional ownership, you will find that a 1/16 share (20 days) of the same plane go down to 624,500 USD. Monthly shared expenses are 5,900 USD and the owner hourly rate is 2,085 USD. However, there are situation when fractional ownership doesn’t make sense. For example, if your flights tend to be a short ride of 30 minutes, be aware that most fractional plans operate in terms of flight hours, so you will find that such a short flight costs you double. Are you thinking about getting your own private jet? Contact us for more information and we can help you decide and show you your options according to your needs.